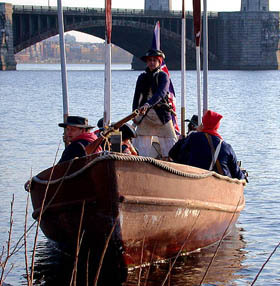 Glover's Regiment was re-born as a re-enactment unit to represent Marblehead in the 1976 Bicentennial. Portraying our Colonial counterparts, we traveled up and down the East Coast, from Maine to Virginia celebrating the fighting fishermen of Marblehead. How we saved our organization from terminal attrition in the subsequent decades - how we became a growing family of families representing not only the fighting fishermen of Glover's Regiment, but also their wives and children - is a fascinating tale of pride, loyalty, and public support.